crinklynose.com: Polka Dots & Stripes! 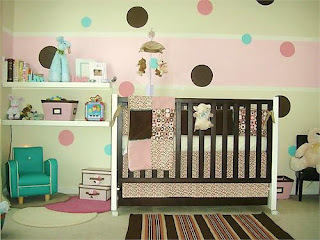 For the past few weekends, hubby and I were occupied cleaning up the other room to make way for Anikka's nursery! Whoohooo! So we finally thought we'd paint one side of the room in stripes and the 3 other sides a combo of light green and brown (and then add polka dotty accents along the border later on). 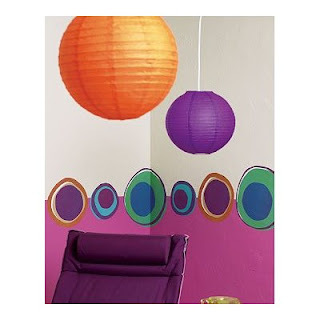 Thank goodness for VOC-free paints (almost odor-free) that makes painting more fun. I hate the chemical fumes from paints so I never imagined myself doing any painting jobs at all. So we bought sample cans of the colors that we like and started messing up with one of the walls. It's actually super fun! Here are some photos I took. 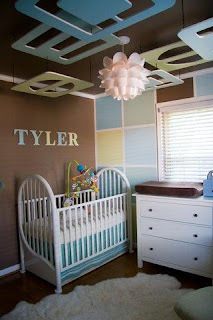 Hopefully, we could get the nursery done soon :o) For more pics, check them here. 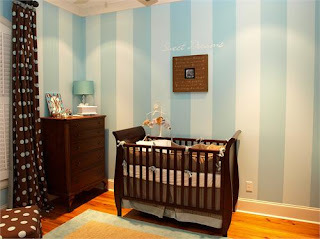 We also found some nursery designs online that kinda look pretty cool as well :o) We originally thought we'd use square patterns vs stripes but we realized squares could be harder. So here are some inspirations we found in the beginning. Maaan, these are just pure labor-of-love. Wow! These are gorgeous ideas. All the best with the painting! hi sis! thanks for swinging by! did you guys go to haleakala?